The protein industry has very specific and dynamic requirements when it comes to tracking the origin of products. SAP Meat and Fish Management by msg has been equipped with a comprehensive range of functions in order to meet these requirements. One outstanding feature among these is the change ID, which includes the option to use a variety of output batches for one production or disassembly order. If you want to enable aggregation (for example meat from Germany, Switzerland and Austria in one batch), this is also very easy to set. There is a range of parameters that tell the system how to behave. If the system nevertheless reaches its limits (due to very specific customer requirements), it is relatively simple to expand it with customer-specific rules. Further information on the change control is available here. 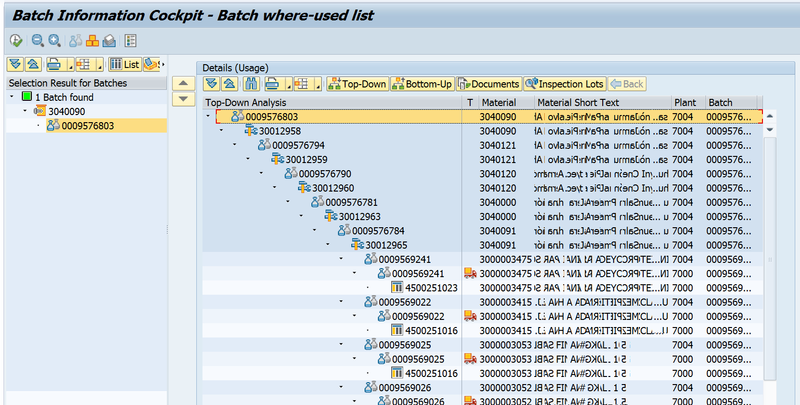 SAP Meat and Fish Management by msg now also offers an extension of the Batch Information Cockpit that enables the additional level of detail of the change ID to be displayed in the analyses as well. If you use Change ID Control, you can carry out tracing at change ID level and thus know exactly which products have been incorporated into a specific batch. This reduces the number of batches to those that are actually relevant and only the essential information is displayed. This is particularly useful when you need to react to problems with products quickly. The analysis can be top-down as well as bottom-up, which means that you can determine at any time the (end) products that a specific batch (e.g. of a raw material from disassembly) has been used in, as well as which batches (e.g. of a raw material) have been used in a specific (end) product. The change ID can also be analyzed in other SAP solutions such as GBT (Global Batch Traceability) and it provides great added value for companies in the meat industry. If we have piqued your interest with this article, please do not hesitate to contact Mr. Stephan Kronbichler (Business Development) if you would like more information: e-mail, telephone: +41 (0)61 508 21 42.